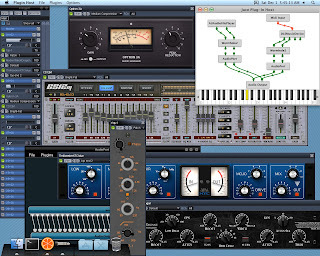 There are plenty of nice free and commercial VST plugins available only for Windows. 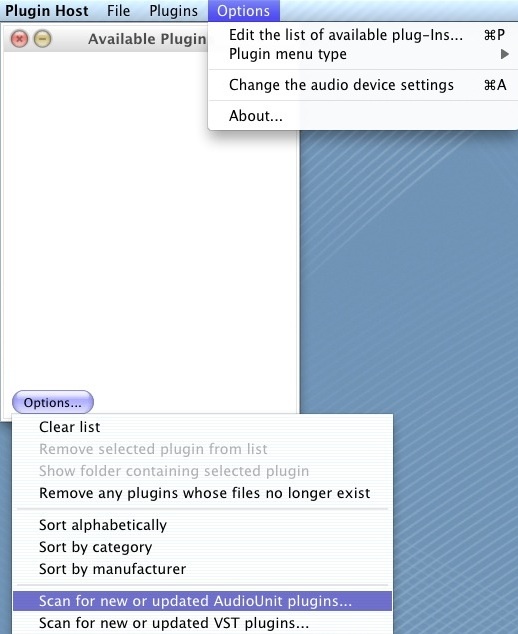 As probably most of you already know, they could be used in your OS X DAW with Wine (JackWASIO, VFX). Or with a virtual machine (VirtualBox, Fusion). Or a networked Win machine.. I've thoroughly tested every single one of these options only to hit disappointment. Initially this post was all about painstakingly setting up a VST host in wacvst. But instead of refining and updating the wacvst post as intended, I finally came to a more decent conclusion. Actually bringing back a three years old idea of mine and improving it so I can share it with you, would be the only way to go in using the smoothest and easiest to setup method of having Win VST plugins in the mix as well. Initially prepared and tested successfully on 10.6.8 and later on 10.8.5. Based on your feedback it should work on Mavericks as well. Please take note that functionality with various DAWs is something I won't cover and discuss apart from generic guidelines. It should work with any DAW and it's up to you how you set it up. And I won't discuss any stuff that's already covered in this tutorial so please read it thoroughly before asking any questions. Plugwire is beerware, if you need the "pro" version with up to 16 stereo channels, please click the Donate button on the top right corner of this blog and I'll get back to you. You will still need the AudioPort Universal bundle (trial or bought) and if you want to save your setups, a Windows license for energyXT. Double-click to unpack AudioPort Universal, then unpack AudioPort Plug-in Setup MAC and install it. 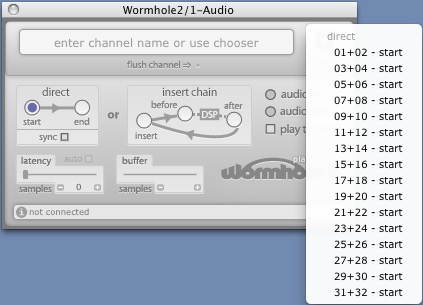 Unpack Wormhole2 and put Wormhole2.component in /Library/Audio/Plug-Ins/Components. Mount plugwire.dmg and drag the plugwire folder to Applications. Drag the plugwire app in the Dock then drag the AudioPort Host msi file in plugwire to install it. Few users have previously reported an install error: "No new executables found!". If you drag the msi package in plugwire and the install window won't show up (plugwire sits open in the Dock for a few seconds then quits) just make sure your application firewall is not blocking plugwire from making loopback connections. Start plugwire and enter the trial key provided by the developer in the readme file bundled with the AudioPort Universal package. AudioPort Host should now be running. Before getting to the real business of using plugwire with your DAW, I strongly suggest to try to understand how this whole setup works based on the quick demonstration with Juce Plug-in Host. Mount PluginHost.dmg and drag to Applications. Start PluginHost, go to "Options/Change the audio device settings" to configure your audio, then scan your AU plugins as shown on the left. Besides the default Apple AU plugins and others you might have installed, Wormhole2 and AudioPort should show up in the list. File/Open plugwire.filtergraph provided in quicktest.zip, double-click on AUAudioFilePlayer module, load some audio file, check Loop, click the Play button and leave that window open. Double-click on both AudioPort modules and click Connect. You should be connected now to AudioPort Host and in the AudioPort Host window the "File/Open recent file" option should be available, load the default plugwire project then double-click on the energyXT module. You should hear now your audio file and on the second channel you can also play some keys along with it if you have a controller active. If not, just focus on the Juce Plug-in Host window and play some keys on your computer keyboard. Now for the most important part, using Win VST plugins, just click on the "1" button to load them as you see on the right. You can close plugwire from the plugwire menu on the top left of your screen: plugwire/Quit. Just drag your plugin's setup file (executable) in plugwire and install, your plugin should be now in the VSTplugins folder. Some installers will place manuals in the Documents subfolder. Then there's the VSTplugins subfolder where you should copy those without an installer (dll). You can even drop them whilst plugwire is already running. On a track you want to process consider the Wormhole2 and AudioPort plugins as the IN and OUT pair of an insert unit, as you can see in the Juce Plug-In Host window from the main screenshot of this post. The actual insert unit is one channel in plugwire on which you load Win VST plugins. Wormhole2 sends audio to plugwire using streaming over network and AudioPort fetches the processed audio from plugwire in the same manner. Obviously there's no actual streaming over a physical network, but the concept is exactly what makes my setup completely different from any other solution out there in that we can use simultaneously 16 independent plugwire stereo channels. Start plugwire and in your DAW load a pair of Wormhole2 and AudioPort on the tracks you want to process. 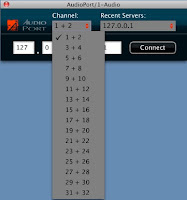 Connect to 127.0.0.1 all the AudioPort instances you've loaded making sure you start with selecting channel 1+2 as in the screencap then choose for each the next unused channel from the list of channels. Load the default plugwire project in AudioPort Host and finally in your DAW choose in the Wormhole2 instances the corresponding numbered channels. In AudioPort Host double-click on the energyXT module and you're good to go. 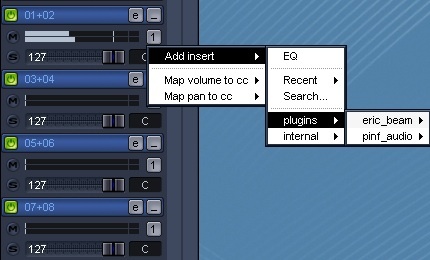 You can MIDI map in energyXT all your plugins' parameters. Check the IAC Driver part in the Win VST instruments section below. Same goes for a controller if you use one. The only way I would recommend for any DAW is to arm a new track and record the processing that takes place in plugwire. If you won't need the original tracks anymore it's important to record starting with the track assigned to the last used plugwire channel, then the previous and so on. I'll explain why in the notes section below. For Ableton Live users there is a way of using its freeze feature which I could append to this tutorial later on if requested. It's mostly based on my 1st post (direct mode). If you can't see any channels in Wormhole2, load the pair of Wormhole2 and AudioPort plugins on the tracks you want to process before starting plugwire. The AudioPort instance connected to 1+2 must be connected at all times otherwise the other channels will be unusable even if they are connected. So make sure you don't unload it or you don't delete any track which contains it. Also make sure before any recording that in this particular AudioPort instance (1+2) you click Disconnect then Connect to get rid of any latency. In real-time if you need click Disconnect/Connect as often as you feel the tracks are out of sync. Never hit Save in AudioPort Host because correct saving is not possible whilst energyXT is in demo mode. It will actually save, but unfortunately rewrite the default plugwire project in that you will end up with an empty one. After you buy a Windows license for energyXT, I strongly recommend though saving your projects from within energyXT and not AudioPort Host, otherwise plugwire would most probably crash at loading those projects. Don't expect every single Win VST plugin to work, few might randomly crash plugwire like some of the included good old Eric Beam plugins. I'm very confident however that the vast majority of Win VST plugins out there should work flawlessly. For instruments we won't be needing the Wormhole2 plugin. Just the AudioPort and for sequencing the IAC Driver: "Device is online" checked in Utilities/Audio MIDI Setup/MIDI Studio/IAC Driver Properties. Start plugwire then in your DAW set your MIDI track's output to IAC Driver Bus 1. Open an instance of AudioPort on an empty audio track where to fetch your Win VST instrument's audio output and connect it to 127.0.0.1. In AudioPort Host load the default plugwire project, right-click on the energyXT module to make sure in MIDI devices Bus 1 is selected then double-click on the energyXT module. In the energyXT window click right next to the Open button then New/Empty project. Drag the bottom right corner of the energyXT's window and you should see 2 modules: Master In and Master Out. Right-click in that area and choose your instrument from the plugins list. Make sure its MIDI input is connected to the Master In module and its audio output to Master Out. Now you should be able to play, record and MIDI map your instrument. Hey thanks for taking the time to explain in detail. I just find a little difficult to understand the setup with DAW. Would you tell me where exactly load each of those 3 plugins? Say you have some audio track you want to process with Win VST plugs. Before starting the plugwire app, in your DAW you load on that track first Wormhole2 AU and then AudioPort AU as you would normally load plugs, one right after the other. The audio signal enters Wormhole2 AU which passes it outside your DAW to plugwire then AudioPort AU fetches it back from plugwire. Start plugwire, then connect the AudioPort AU to 127.0.0.1, channel 1+2. Now load in AudioPort Host the default plugwire project you see in the list of recently opened files. Focus back on your DAW and in Wormhole2 AU choose in the list of channels 01+02. Now you should hear your track. Go back to AudioPort Host and double-click on the energyXT module and a mixer would pop-up. There is where you load your Win VST plugins, by clicking on the "1" button. We can do this for up to 16 stereo tracks simultaneously so we are actually able to mix in real-time with Win plugs as well. There you go, cheers! thanks but so difficult for load VST and looks like only in AU host? not VST host like Cubase or Nuendo? Very good point. "AudioPort Plug-in Setup MAC" installs AudioPort VST as well. Unpack Wormhole2 and put Wormhole2.vst in /Library/Audio/Plug-Ins/VST. Now you're good to go. Hmmmm..... I get to Quick test in Juce plug in host: "then scan your plug ins as shown on the left" - I don't know if someones update the software but there isn't a scan function nor even an available plug in list to check for an options box. In Options you should click first on "Edit the list of available plug-ins..."
Unfortunately, I can't help you with Logic. Can you try with another DAW? I got exactly the same problem with Logic Express 8 on Lion (10.7.5). Testing with JUCE Plugin Host worked great, but when I insert the AudioPort plug-in in a channel in Logic, the pre-defined IP address is always 127.1.1.1. Even if I enter 127.0.0.1 manually, it's impossible to establish a connection to the AudioPort Host application. Logic seems to block the local network connection somehow. In Ableton Live 8 i was able to connect the AudioPort plug-in with the host but i couldn't get Wormhole2 to work, as both the VST and AU version of the plug-in always cause Live to freeze completely. So this is the first confirmation of functionality with Lion. With some problems, the biggest one, it doesn't work with Logic but I need more confirmations. If it really doesn't work or you actually need to set Logic up differently with it. The second problem, Wormhole doesn't work with Live 8 on Lion but I need more confirmations on this too. At least you can use the instruments part. Thanks for feedback! I'm confident there must be an easier way with Logic, for it to work as it's supposed to work, maybe some more experienced Logic users will figure it out. Cheers! This is quite complicated. Since it's such an important topic, you should consider making a video walkthrough. I am stuck at the part where it says "File/Open plugwire.filtergraph provided in quicktest.zip, double-click on AUAudioFilePlayer module, load some audio file, check Loop, Click the Play button and leave that window open." Where are you stuck more exactly? I'll be happy to post a video made by users. fyi, I think this is fantastic and I am very excited to get it working! No, File/Open in Juce Plug-in Host. Cheers! The weird thing is it worked the first time it opened and looked just like yours.. I could even play the piano sample.. PLEASE HELP!! Sorry, a dll plugin like "retro delay" for example, thanks! is it possible that the vstplugin folder is being read somewhere else on the computer? If it's deleted it definitely shouldn't show up, I don't really get what you mean. Absolutly love this, works great. Is there a way to synch to your hosts BPM, or type in the bpm in XT or Audioport? Thanks. See the important notes section. The license you bought for 2.5 should work for 1.4.1 as well. Thanks for your feedback! So Wormhole freezes Live 8 on Lion according to Rob but it works with Live 8 on ML, that's odd. I finally got running with Logic Express 8 and Live 8 too. Now I can confirm full functionality on Lion as well! Hi Rob, Can you explain to us how have you done it to make it work with Logic? 1) Does it matter if I do this on an Audio Track or a MIDI Track? 2) On a track in Ableton, I put wormhole au, then audioport au. I opened plugwire, connected audioport au to 127.0.0.1, went to plugwire to load the file but the 'open' option was greyed out. Help please? at first, thank you for this description, but it should be more useful this also translate into german language e.g. Hello，I found out the way to use with Logic，The tip is the Audio track have to put some audio (something or dummy)，and just play it，then click the connect，the host will be connected. THANKS! works great, i was looking for something like this for YEARS!!! Again, thanks a lot! Thanks to James from Los Angeles for the first donation! First 16 stereo channels plugwire has been shipped to Senne from Gent! 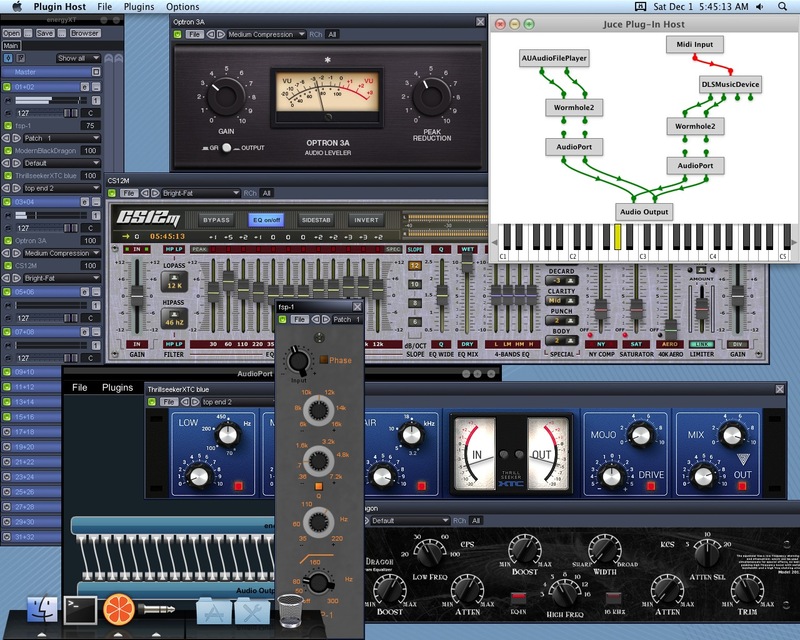 So is there anyone who have tired to play win vst instruments in Logic 9 with plugwire? But it does not work for me. I stuck at connecting to audioport. Are you using Logic by any chance? There's confirmation in previous comments from other Logic users, maybe they could help. This is amazing piece of software engineering and great guide enennu !!! Running PC VST FX (TAL-Chorus-LX.dll) works on OSX 10.8.5 on Macbook Air (September 2013 - i5@1.3Ghz) in Logic 9.1.8 (32-bit) using Built-in audio output. I was sending Logic ES-E synth into the PC VST FX. Works ! The latency is there but its pretty usable. Thanks a lot for your detailed feedback, I wish more people would at least do the same if not donating but there you go. Pity about IAC, can't help you with that. Cheers! Again many thanks for your feedback, I'm glad everything works for you now. Enjoy! Thanks to Brian for the generous donation! And many thanks to Rotislav from Prague for the most generous appreciation! Thank you so much for this article ! I tried this with Reaper 4.55 32 bit on OSX 10.9 and it works perfectly. Tested it with the Cygnus-SF and DSK Ethereal Pads plugins. I had some trouble with the Reaper 64bit version, since it was unable to recognise the Wormhole plugin. I know, for the instrument VSTs I don't need Wormhole, but I wanted to make sure the installation works. I would like to say thanks again with a small donation. Thank you for feedback and donation! Plugwire 16 stereo channels version coming your way, enjoy and let me know if you run into any problems! Great work! Quick question - can this work with MIDI plug-ins as well? I have a Win-only arpeggiator from which I would like to receive MIDI from my host. I can send MIDI via IAC bus into EnergyXT, and I see that the last EnergyXT output in the AudioPort Host window is a MIDI output. But can this be connected back out via IAC bus, or does AudioPort work with audio only? Pity that the MIDI out pin is unusable as far as I can see. Thanks again for publishing your findings.I will donate asap. For logic users on mac.I have got as far as getting audio port connected using a logic audio channel.To activate the connection you will need to physically drag any audio file you have in to the channel and then hit play on your logic transport bar.Then click connect on audio port while logic is playing and it will connect.If you dont put audio in the logic audio channel audioport wont work. I still don't know how to get logic to talk to audio port for the midi.Audio is fine,but i suspect logic is grabbing all the midi ports for the usb m-audio keyboard. So some how I would need to get logic to send midi to audio port and xt plugins via iac midi. Apart from that all works fine on ableton 9 on mac osx leopard. Just need to figure out how midi up logic to talk to audioport. Thank you for the idea you created.I have expanded on your idea for Logic 9. I made a video for it below. I will donate and thanks again for putting your ideas in public,thats how we make the world move forward. So now midi and audio work with your idea in logic 9 mac osx 10.6.3 and any osx I think. Thanks a lot for the video, enjoy! another plugwire pro sent to Ricard from Valencia! Hello. Thanks for the tutorial. Although the generic setup seems to be right, I can't load oatmeal VSTi (http://www.vstplanet.com/News/photos/Oatmeal/oatmeal38-1.zip). It simply give me an unknown error while loading and can't show its main screen, like it couldn't load preferences or a skin. All necessary files are copied to VST plugin folder... Any idea? Thank you! Would really appreciate you taking the time to possibly reupload this stuff. There are tons of us that more than appreciate the work you've done and would love to play around with these plugins you put so much effort in to. I'm very short on cash at the moment. This is the first month I've had any income in 8 years of battling spinal tumors. I could donate a couple of dollars now, and more next month if it would get this to actually work. When I launch plugwire, all I get is the Wineskin window, and if I try to install AudioPort, I get the "no executable" error, even though I have disabled the firewall completely. I'm hesitant to donate for something that seems to be dead out of the gate, but I would be happy to donate for something that actually works. It would be a great help for the 501c3 that will be funded by our voice over studio that is in the construction planning stage. I'm working with a local shelter to help the homeless help the homeless, and the only type of fundraising I can do is voice over and audio work lying down. This would be hugely helpful, as some of the plugins I need are only available on Windows, and Windows is simply not up to any kind of professional workflow.